Julia had her first Forró class in 2011 in Cologne with Maria de Bahia and later with Rudolfo and Vê and she felt in love with this dance ever since. What she likes most about Forró is its happiness, its diversity of dancestyles and of paces inbetween the different rhythms of music you can dance Forró to. Julia went to almost all available Forró Festivals in 2011-2013 and as she had already been dancing Ballett, Hip Hop etc since she was a little child and Salsa since 2008 she improved quite fast and startet soon to give her own classes together with Markus Scherer within the teachers group from FdC. After studying dances more intensively in Cuba for 6 month she formed the group Forró TMJ in 2014 together with Tiago Moraes and Markus Scherer and they started developing together a completely own and unique concept of teaching social dances. 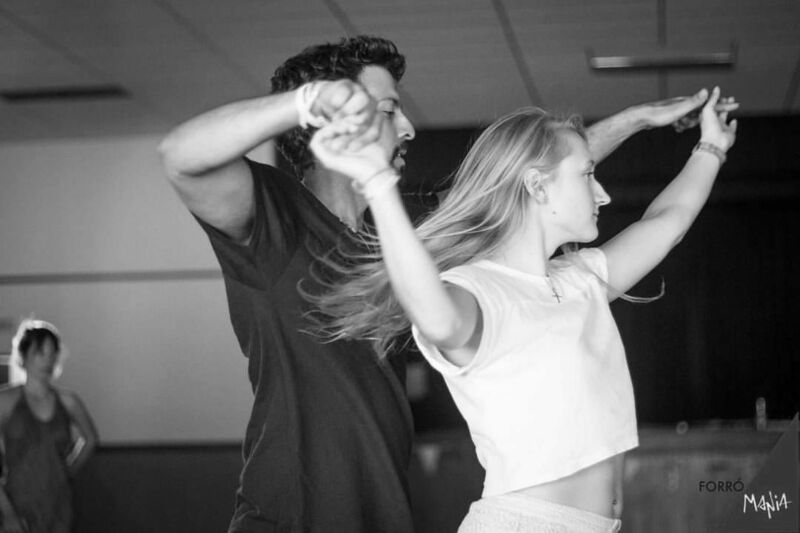 It is based on different ideas of connection and techniques for leading and following to make social dancing comfortable and giving the dancers the possibility of applying the concept to every social dance, to every dancer and to have the freedom to control all the movements to the music together with the partner. Also leader and follower in the dance are both included with absolutely same responsability and possibilities within the dance and the classes. With this concept they teached since then Forró, Zouk, Salsa Cubana and Samba de Gafieira classes. Some of their biggest achievements have been teaching in the Forró de Colônia Festival 2013; Forró de Domingo Stuttgart Festival 2017 and teaching at Forrómania in Portugal 2017. And there is more to come! They are always working on learning more and more, may it be other Forró Styles as also other social dances as West Coast Swing, Tango, Bachata, Kizomba etc. because every new influence could make you a better dancer and teacher. also musicality conscience, later improved when he started to play Drums. Tiago studied 2,5 years Physical Education (licenciature) in Brazil. At this period was invited to Thays Reis´s Group to dance Jazz for 1,5 year. When he finally started his Bachelor in Sports & Performance in Cologne (Germany) on 2011 he started to have Classes With Rudolfo on Forró de Colonia and began to go to every festival as possible and dedicated himself to learn Forró. Tiago has been giving Workshops all around Europe doing the two things that he is passionate to… Teaching & Dancing.